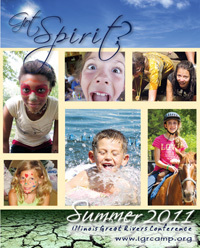 The 2011 Camping catalog was a part of the February issue of The Current and has been mailed to those who registered for a camp in 2010. Additional copies of the catalog may be downloaded from the IGRC website. The online registration also includes online health forms that are available for download. Those attending Family Camps, Parent/Child, My Shepherd & Me, there is a Family Registration Form that is available by download or by calling the Camping Office. NEW THIS YEAR: You may complete the health history form online when registering. A health form must be completed for each camper (including adults). This is required for the campsites due to American Camping Association accreditation. Registration will not be considered complete until a health form is received. A minimum registration deposit of $50 per camp, per person, is required. Camp payments are accepted using MasterCard or Visa and must be submitted in writing with signature. There is a 3 percent transaction fee charged. Payments cannot be accepted by phone. Indicate the camper’s name and camp number on all checks. For proper credit, checks must be sent to the Springfield Camping Office. Do not take payment to the campsite. Registration deadline is three weeks prior to the start of the camp. Registrations received less than three weeks before the start of camp must be approved by the Camp Office or Camp Dean. Online registrations received less than three weeks prior to the start of camp will not receive $25 off of the registration fee. In all cases, an attempt will be made to reschedule a camper into another week of camp. Refunds for health reasons are available upon request. Full refunds will not be made after the start of camp. If it is not possible to reschedule the camper, the cancellation policy is as follows: 45 days prior to camp, full refund; 30 to 45 days prior to camp, refund all but $50; 30 days prior to camp, refund for emergency only. The grade listed in the brochure is the grade the camper will be entering in the fall of 2011. The camping office will do its best to honor cabin mate requests provided the request is made by both campers. Many churches and church groups offer camp scholarships. If your church cannot provide sufficient help, ask your pastor or camp coordinator to contact Camping/Retreat Ministries, 217-529-3007, for information regarding scholarship funding that may be available. Insurance for registered campers is provided through the IGRC accidental insurance program. This is a supplemental policy and the participant’s own health insurance is the primary coverage for the camper. The dates for Beulah Holiness Camp and Mission Blitz (BC255) is incorrectly listed in the camp brochure. The correct dates for the encampment is July 29 through Aug. 5.